With just one stop remaining in the North American Cup Alpine Skiing series, there will be a race to the finish next week at Whiteface Mountain as the 1980 Olympic alpine host will decide the circuit’s individual discipline and overall titles. The men and women will contest a pair of slaloms each in Ontario this week before heading to Whiteface for the NorAm finale March 11-16. 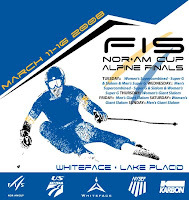 The North American Cup (NorAm) is one of the proving grounds for future alpine skiers, comparable to minor league baseball’s Triple A circuit. Athletes who win titles also are awarded a start spot on the World Cup circuit, the majors, for the following season, jump starting their international ski racing careers.